My sister used to work at the MoMA museum and always came home with the most interesting and creative Christmas gifts which she purchased at the MoMA Store. The website and actual store at the museum is a wonderful one-stop shop for gifts for the whole family. Here are a few of my favorite childrens gifts. 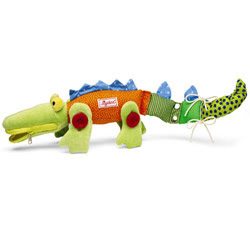 Touch & Learn Crocodile is a stuffed animal which can aid in teaching children how to snap, tie, button, and zip. This gift is not intended for children under the age of 3 since there are buttons and small pieces. 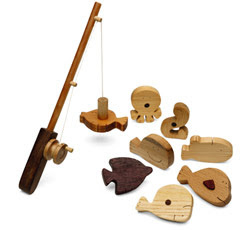 Wooden Fishing Play Set is a type of go-fish game where the child attempts to "fish" with a wooden magnetic pole. I like this game because it teaches the child hand/eye coordination and since the fish are wood, any younger siblings are safe to use the fish as teething toys (a two gifts in one combination). 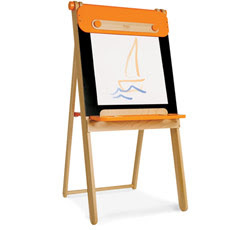 Art Easel/Puppet Theatre is a wonderful gift because it is actually four gifts in one and promotes creativity: art easel, dry-erase board, puppet theatre, and chalk board. And better yet is folds up for easy storage. The Magnetic Alphabet Set is chic and educational. This set is unusual because the letters are soft and are 4 inches tall. When placed on a fridge (or a wall painted with magnetic paint), they almost look like art. The colors are vivid and the texture adds an interesting depth. I would definitely not mind having these posted on the fridge in my kitchen. 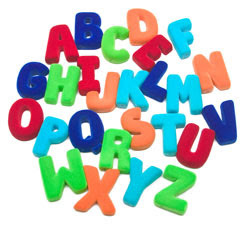 I recommend purchasing 2-3 sets so that the child can actually use them to spell words (since a set only comes with 26 letters). Now for the teenager or college student interested in design (father or father-in-law or brother-in-law), Lego has developed an array of architectural pieces which are challenging and can later be used as decoration in an office. 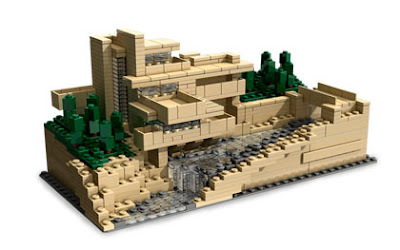 The MoMA store carries Falling Water (811 blocks) and the Empire State Building (77 blocks) but you can also find them on-line at Lego along with the Taj Mahal.